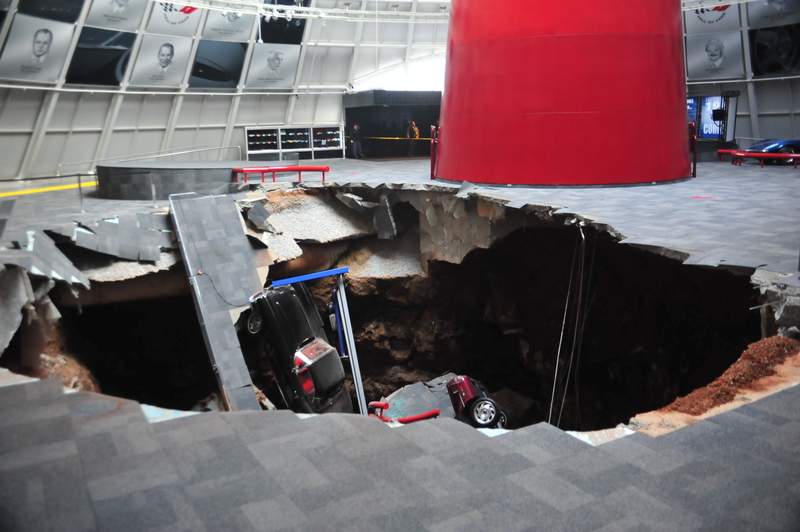 BOWLING GREEN, Ky. -- A sinkhole collapsed part of the National Corvette Museum in Kentucky on Wednesday, damaging eight cars there but not shutting down the facility. Museum spokeswoman Katie Frassinelli said six of the cars were owned by the museum and two - a 1993 ZR-1 Spyder and a 2009 ZR1 Blue Devil - were on loan from General Motors. The hole is in part of the domed section of the museum, and that area will remain closed. That's an original part of the facility for which was completed in 1994. Museum Executive Director Wendell Strode told the Bowling Green Daily News that the hole is about 20 feet deep. Lancaster said information was still being gathered about what exactly happened, but it appeared to be the first incident of its kind at the property. Bowling Green sits in the midst of the state's largest karst region - the Western Pennyroyal area, where many of Kentucky's longest and deepest caves run underground. A karst display distinctive surface features, including sinkholes.